Annual Portside Bait & Liquor Mille Lacs PERCH EXTRAVAGANZA fishing contest. Sponsored by Portside Bait and Liquor and held at Nitti’s Hunter’s Point Resort north of Isle, this contest allows anglers to go anywhere on the lake, and nearby resorts plow roads and provide maps so contest-goers have easy access to fishing hotspots. Event organizers say the largest perch ever caught in the contest was 1 pound, 12 ounces, and it typically takes a perch well-over 1 pound to place in the top 10. 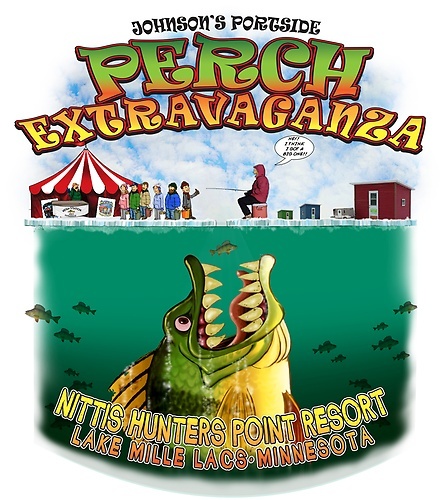 The Perch Extravaganza is considered the last hurrah to the Mille Lacs ice fishing season. Cost is $20 for an entry button, which is good for both the fishing contest and prize drawings afterward. In total, hundreds of prizes will be awarded, to both the top 10 contest finishers as well as drawing winners. Prizes will include Ice Castle fish houses, cash, flat screen TVs, fishing electronics, underwater cameras, drones and more.